× 5 = 45 Required Please enter the correct value. 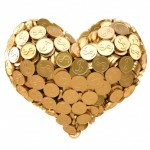 The Love Trade for Gold is Still On! 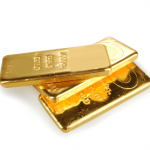 Are Gold Prices Near a Bottom? We've been studying the resource markets - and gold in particular - for over 30 years. And have seen almost every cycle the yellow metal has gone through. One thing is certain in our opinion: International investors, central banks and corporations are all looking to buy gold... And these slow summer months are likely providing the best price. Asian investors, especially in China and India, are buying coins and bullion like mad. 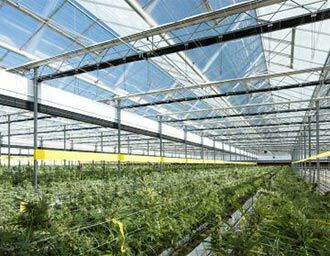 Sales are up 22% annually in China and 52% in India. Gold analyst Jim Willie put it best when he said: "The migration of gold from West to East is the grand story of the decade." They know, as our dear friend Richard Russell recently reminded us, that gold and international power still go hand in hand. Beyond the obvious demand, history is also on gold's side. Gold's movements are in line with historic trends, never mind what the no-nothing, hand-wringing Cassandras are saying. In fact, we believe this is a unique moment in history to get gold on the cheap, and take advantage of before the end of summer. Of course, the ongoing "tapering talk" from the Fed pushed gold down sharply. That's because if the Fed stops stimulating the economy, an inflationary outcome is unlikely, especially if it's combined with higher interest rates that boost the value of the dollar. That's bad for gold. What's more, there may be darker forces at work as well. There's a distinct possibility the gold market was manipulated [Editor's Note: here's who did it]. Yet the bottom line is that nothing material changed to justify a $700 drop in gold prices from over $1,903 in 2011 to almost $1,200 earlier this month. The answer to why gold prices are going down today isn't hard to find - it's a testament to the power behind Fed Chairman Ben Bernanke. Comex August gold fell $76.50, or 5.56%, to 1,229.50 in early morning trading Thursday. The August contract traded as low as $1,285.00 in overnight trading as the U.S. dollar rose to the highest in more than a week against six major currencies. Gold prices plunged Thursday to near three-year lows as precious metals investors took a "risk-off" stance following Wednesday's FOMC meeting. Bernanke announced that the current $85 billion worth of monthly bond purchases could slow near the end of this year, and end in 2014, if the economy keeps improving. He said interest rates could increase "far in the future." 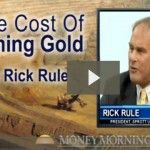 With gold prices near two-year lows through much of 2013, a bargain-hunting Money Morning TV viewer asked us about how to invest in gold. Rick Rule, the founder and chairman of Sprott Global Resources Investments, provided the answers. Rule says he'd put a portion of the money into gold bullion and a portion into gold stocks. But he warns those unfamiliar with the sector should stick to what they know: If you're bullish on gold, buy gold, but realize gold stocks don't necessarily mirror the price of the yellow metal. 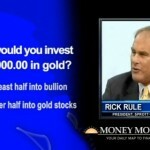 Check out exactly how Rick Rule would invest $100,000 today in the yellow metal in the video below. The last several months have been tough on gold prices, but gold bugs haven't lost their insatiable appetite for the yellow metal. With gold officially in a bear market, demand is surging at today's bargain prices. Gold demand is especially strong in India, where gold is the investment of choice among consumers. India's gold imports reached 162 tons in May, almost twice the average level. That's why last week the country - the world's biggest consumer of gold - increased the duty of gold imports for the second time in six months. in attempts to decelerate the accelerating gold demand. Bullion prices fell 0.25% to $1,399.36 an ounce following the move. Gold imports are one of the biggest contributors to India's mushrooming account deficit (which occurs when imports exceed exports). An increasing deficit affects the country's foreign exchange reserves and the value of its currency. Friday, the ruppe closed below the key 57 mark against the U.S. dollar for the first time in a year. The slide further casts a shadow on India's economy amid pricier imports and heightened inflationary risks. Policy makers in India have been attempting to reduce its deficit and improve finances as it faces possible rating downgrades. They hope the duty increase will help. The Federal Reserve and other central banks keep printing money. The U.S. stock market is soaring. And gold prices, after a brief recovery, have continued their plunge. Are these phenomena connected? 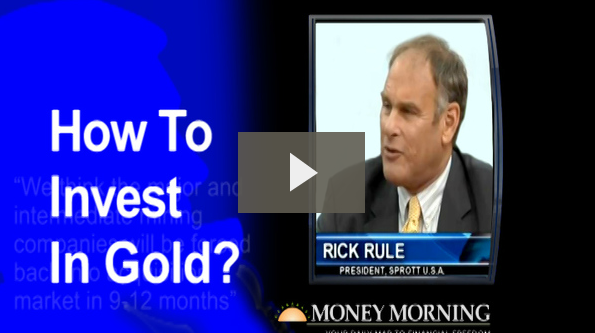 We put the question to one of the world's foremost gold experts, Rick Rule, founder and chairman of Sprott Global Resources Investments. 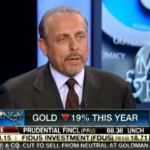 Listen to his explanation for falling gold prices in the following interview. And even as gold prices sink, mining costs have climbed. If gold prices keep falling, miners could take "fairly drastic measures" to remain profitable, according to Rule. Check out Rule's analysis in the accompanying video. As pointed out in a recent article by Money Morning Global Resource Specialist Peter Krauth, there is something interesting happening with gold prices. Paper gold, controlled by Wall Street, is going down. But demand for physical gold all over the globe is going up every time that gold prices are down. That's not the only place divergences are occurring in the global gold market. A divergence can even be seen in the difference between Wall Street speculators and commercial interests in the paper gold market. The speculative momentum players continue piling on shorts, while commercial interests are following a path 180 degrees opposite. The question remains for those investors interested in gold as to who will be right in the end. 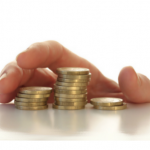 The short-term Wall Street speculators or more long-term players? It's been a tumultuous couple of months for the yellow metal, which has investors asking: Are gold prices near a bottom? There's hope this price plunge is ending. Year-to-date, gold is lower by 17%. But after seven trading sessions where gold prices slumped, on Monday June gold futures gained 1.4%, or $19.40, to $1,384.10. Contract prices bounced as much as 2.4% after sliding 2.1%. Now technical analysis points to a rebound in the yellow metal to $1,500 in June, following the "double bottom" hit Monday. A double bottom involves three moves: a drop, a rebound, and another drop to the previous low. Chart watchers deem the pattern as bullish. A classic double bottom reversal typically marks an intermediate or long term change in trend. "This shows that gold is probably ready to climb," Matthew Schilling, a commodity broker at Chicago based R.J. O'Brien told Bloomberg News. "The reversal was proof that we have found a bottom." In just 10 minutes Monday, in the wake of gold's rally, holdings in exchange-traded products backed by gold soared by $1.7 billion. Fueling the buying were comments from Moody's that a downgrade of U.S. debt is likely if the government fails to get its finances in order in 2013. To get more info, we asked Morning Morning Global Resource Specialist Peter Krauth if he thought a gold-price bottom was near. "I thing gold is somewhat oversold," Krauth said. 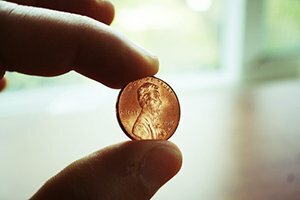 "Yesterday's price action, when gold shot up by about $40 within four hours seems to reflect the thinking that it's due for a bounce." Krauth said this year's gold price correction was expected. "After a 12-year bull market with no true correction like that in 1974-1976 time frame, one more is due. I would not be surprised to see gold eventually correct a bit further before making a final bottom. "That being said, if it were to turn up and stay above $1,550, then it's likely this correction would be over," he continued. Gold investors are just not feeling the love, once again left to wonder why gold prices are going down. The yellow metal dipped again Thursday, with gold for June delivery ending down $10 at $1,386.10 an ounce. It was the sixth consecutive trading day of declines and marked a four-week low for the metal. With equity markets continuing to log record highs, and economic data showing some signs of improvement, safe haven gold looks nothing like its moniker. Fueling gold's recent rout is not one thing; it's a combination of things. Here's why gold prices are going down this week.